Founded in 1988, General Crane has been providing products and services for general industry throughout the southeast. They manufacture and sell overhead bridge cranes, gantry cranes, jib cranes and runway systems of our own design. Parts and service are available to support the equipment that they manufacture and other brands as well. 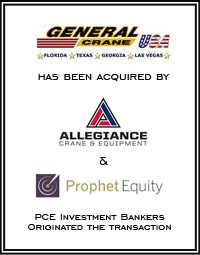 In addition, General Crane is also providing warehouse space to Street Crane Company LTD.